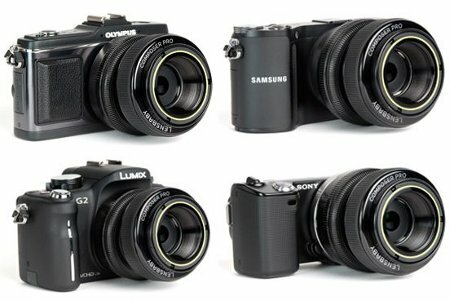 When it comes to digital cameras, there are those who use the standard entry level to mid-range digital cameras, while serious enthusiasts as well as professionals decide to fall back upon the DSLR. However, in recent years, there has been a new category that cropped up along the way – the Micro Four Thirds segment, and it has been embraced by Panasonic, Olympus, Sony and Samsung. I am then pleased to announce that camera accessories manufacturers have not overlooked this particular new segment of the digital camera market, and Lensbaby fails to disappoint with their latest Composer Pro which targets Micro Four Thirds cameras. The Composer Pro is Lensbaby’s popular SLR creative effects camera lens that will now play nice with Panasonic’s Lumix G Micro System range, Olympus’ PEN series, Sony’s very own α NEX, and Samsung’s NX shooters. Basically, the Composer Pro for mirrorless cameras will also play nice with the Lensbaby Optic Swap System, where it will ship with the Double Glass Optic installed. The original Composer Pro for non Micro Four Thirds cameras first rolled out in March last year, helping refine and enhance the popular and award winning Lensbaby Composer through the simple upgrading of the swivel ball and focus mechanism in order to deliver a professional level of performance. The Composer Pro will come with a metal swivel ball design as well as refined focus mechanism in order to offer ultra-smooth focus and tilt control. This particular updated focus mechanism sports a fluid and accurate dampened focus ring that can be compared to the focus mechanisms of the highest quality professional manual focus lenses. As for the Double Glass Optic, it is a 50mm f/2 selective focus optic, which is more than capable of churning out a Sweet Spot of sharp focus that photographers can move around the photo simply by tilting the Composer Pro’s swiveling lens body. Expect the Composer Pro to be compatible with the slew of creative optics in the Lensbaby Optic Swap System, such as the Edge 80, Sweet 35, Fisheye, Soft Focus, Pinhole/Zone plate, Single Glass, and Plastic. Individual optics can be swapped into the Composer Pro so that you end up with a different creative effect. Just how much will the Composer Pro for mirrorless cameras cost? We are looking at a $300 price point.